You must make reservations at least 5 minutes in advance of the time at Black Kettle. Our cuisine starts in the Kettle with healthy, savory broths and stocks and are the basis for every dish! 16 Soups at lunch and at dinner every entree starts with a savory pottage. 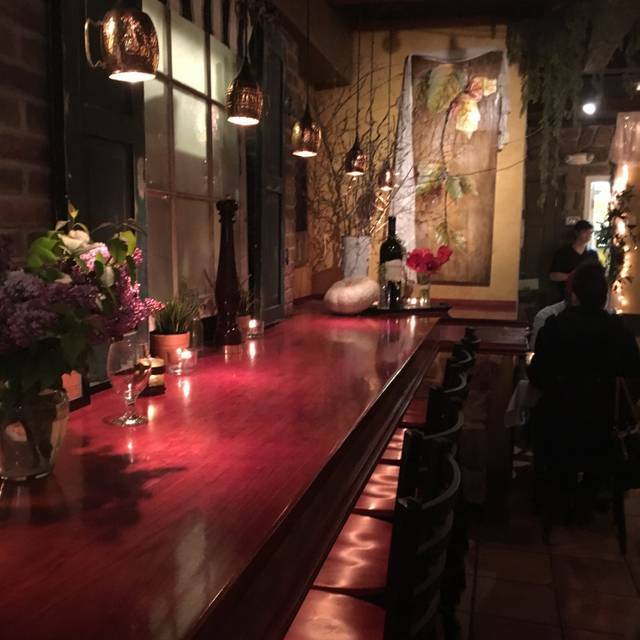 Hand-cut steaks, broad wine list, five different burger creations all at a great price point and cozy, garden-like atmosphere. 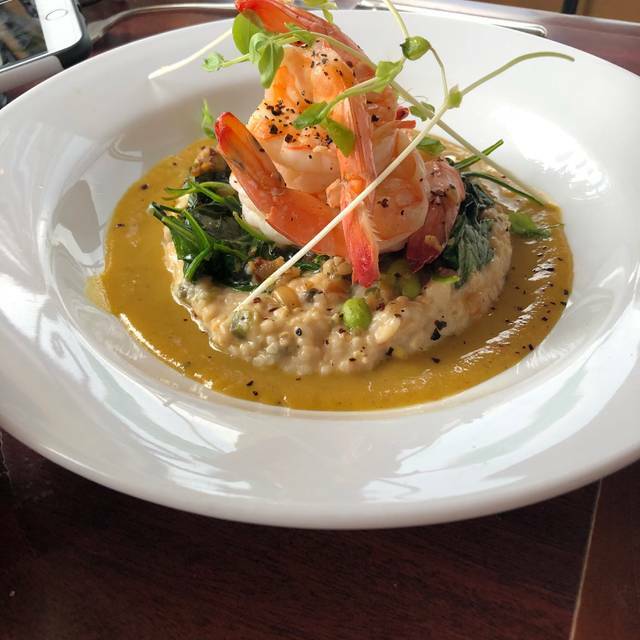 We offer healthy beverages and small plates that are designed to fit anyone's budget and taste. 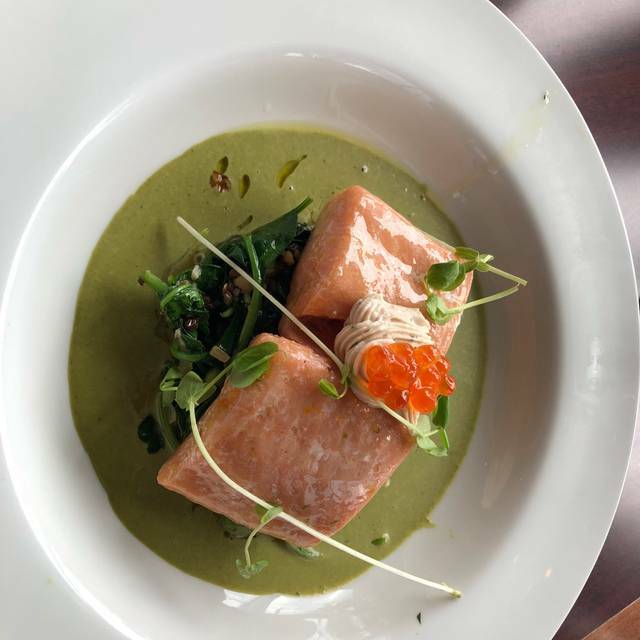 With an extensive Chef-driven entree menu, we're sure you'll find something you'll love, and love that every dish is made from scratch with healthy, fresh ingredients! From the Kettle. Old World Broths. The food is always delicious and very flavorful. Service is Great! Again...had another great meal here. The menu has so many choices. We were there with a gluten free friend and she had many choices. Love the atmosphere. Service was great. Doesn’t break the bank! Went on Saturday with a group of 5 people. Everyone enjoyed their meal. Drinks were great, food was great and dessert was delicious! Looking forward to going back again soon! This was the 4th time I had come to Black Kettle, together with my young daughter. After looking over the menu and prices, I was told of a "special" on rock fish, and I ordered this for myself. I did not ask the price, as I had ordered it before, and do not recall the price being very high. My daughter ordered a chicken and pasta dish, which was delicious. When we received our check I noticed that the total was unusually/unreasonably high ($71 for two people.) I, also, noticed that there was an entree on the bill for $34. The $34 entree was labelled, "seafood pasta.," although I had in reality/truth received the "rock fish special." I questioned the waitress, a somewhat rough looking woman who I have never had before, about the inconsistency. (I had not even ordered pasta, and I don't recall any entree on the menu being as high as $34.) 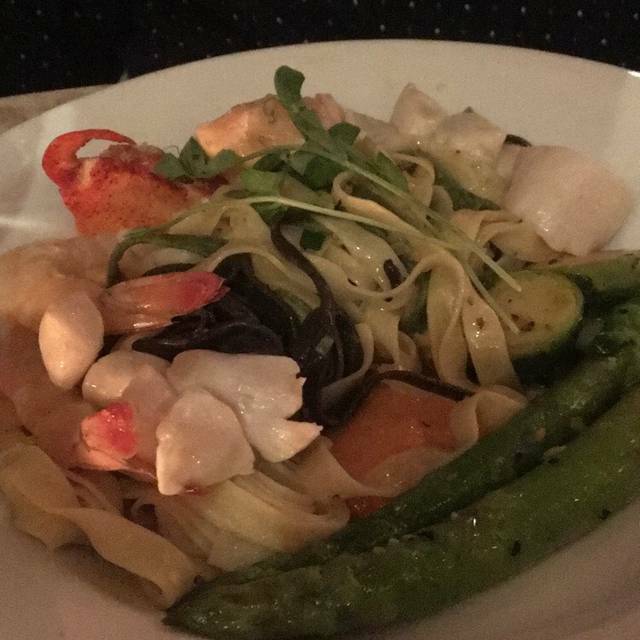 She with indifferent voice tones let me know that the restaurant categorized the rock fish special as seafood pasta, and that I, in deed, owed her $34 for the entree "special." Because my daughter was becoming embarrassed/upset, I paid the bill and left, instead of arguing with her or asking to talk with the manger. Great place! Best dinner I have had in years. And the ambiance is fantastic. Can't believe I never knew this existed! For all the fanciness, the rock cod was bland, the meatball and sauce too salty and not tasty. The head waiter was good. Delicious! It is a place I am able to take my very, very picky husband to enjoy. We both have food allergies, including gluten and dairy. This is now our favorite spot to be able to order so much on the menu without worry. Wonderful food either way. This was our second time at Black Kettle. It was just as fabulous as it was the first time. We absolutely loved the dining experience! All of us enjoyed the ambiance. We will continue to support the outstanding Chef Kevan Vanek. Awesome food, great service, the Catonsville 9 cocktail is a must have. 3 hours of gourmet enjoyment. Consistently outstanding! Black Kettle is one of our favorite places. The service, ambiance and food couldn't have been better. My daughter is a vegetarian and ordered the tofu and veggie bowl. It looked so good that a meat eater could devour it. I ordered white fish, and it was fresh and very, very tasty. Service is always top grade. My only quibble with the service was at the end. We told our waiter that we had theater tickets for an 8pm show. The theater was pretty much down the street, but we had never been there before and there was general seating, so we wanted to leave by 7:30. Our waiter assured us that he'd have the tab on him and all we had to do was ask for it. At 7:25, we asked for it and got it. At 7:30, I went to the ladies room, figuring that it'd be taken care of when I came back. It wasn't. My husband flagged him down at 7:35, and we were out of there by 7:45. By then it was dark, and the place was really hard to find. We got in at 7:55 and were seated in the back row because that was all that was left. If we'd left 15 minutes earlier, we would've had much better seats. This was the second time we had come to the Black Kettle for dinner. The ambiance has been very relaxing with lovely piano music, decorations, and comfortable seating. Pm both occasions. the service was excellent, and the waiters courteous and exceptionally attentive. The food was excellent the first time; i ordered the crab cake entree, and my daughter a veggie burger. During the second occasion, I ordered the salmon burger and fries. The salmon burger was very large, and the fries great. However, the taste of the burger was not up to snuff in regard to flavor. 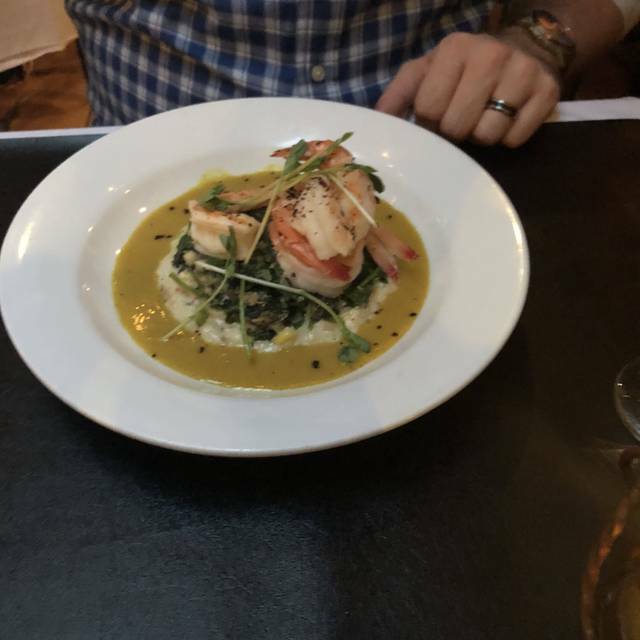 It tasted somewhat like it had some filler in it or the salmon was not completely fresh, so important for sea food. I am uncertain just what the problem was; however, I have made salmon burgers in several different ways, including with fresh salmon, so am aware of expectations. amazing creative and exceptional food at a Great inexpensive cost. The bartender apparently did not know how to make a whiskey sour, so my husband drank the worst he ever had. He does not like to complain or send back. My Moscow mule was fine. The beef stroganoff was ok, but not as tasty as the traditional dish. The seafood bouillabaisse was also not as good as a traditional recipe. The burger was fine. Deserts were ok. cheesecake with brownie crust was good as was the amaretto wedding cake. The chocolate covered ball was not worth the price. The outer shell had very little chocolate taste. We were very happy with our drinks, food and service. It is a little noisy... they are busy so that isn’t really a surprise. Two of us had a light lunch on a Saturday. We each had a bowl of soup and a cup of tea. The soup came with two small pieces of garlic bread. Both of us enjoyed the soups. Our server was very pleasant and very accommodating -- refilling water glasses, getting more hot water for the tea, etc. We had a gift certificate to the Black Kettle so we made a reservation. People without reservations were being turned away. It is a small space. The cocktails were very good and arrived quickly. Our server Mackenize was knowledge and pleasant. The problem was that the kitchen fell far behind and we waited over an hour for our meal. I had to suggest they bring bread since it was taking so long and when it arrived it was still frozen inside so another waiter (not Mackenize) stuck her fingers in it to check. Then heated up the same bread and returned it. Once the food arrived it was very good. I had the seafood special and my husband had a beef dish. Both excellent. The man next to us got the risotto that was supposed to come with his dinner after he was finished and they put it in a to-go cup. There was no understanding that if there is a problem with the kitchen that you should do things to make your customer's wait more pleasant. I would recommend Black Kettle, but perhaps it is better to not go on a Saturday Night when it is crowded. Really good food, great drinks, definitely crowded, and friendly service. Food was fast and had a good amount. Too much decor, poor floor plan, over reaching food. Service was great, but listening to our neighbors conversations was off putting. The shuffle by the front door was a nightmare. I am sure i will go back but perhaps a less busy time. The calimari was good, the stroganoff was great, and the poached salmon was off the chart! We had a new server on a very busy night but overall we had a great experience. I got the seasonal salad which was a Cobb salad combined with other seasonal items like squash and candied walnuts. The salad was quite tasty, but overdressed. My fellow diners got the grilled octopus, grilled Caesar salad and the seafood pot; all were delicious! Our server gave us incorrect information, once about there being no meat in the seasonal salad (there was) and then about the availability of scallops to top a salad (not available). She was also slow to check in with us. However, they were quite busy. We went here for Valentine's Day, the Friday after. The only hiccup was that we had a reservation but had to wait 15 minutes to be seated. The table they had "reserved" for us was not reserved soon enough; a couple was still there half way through our meal. 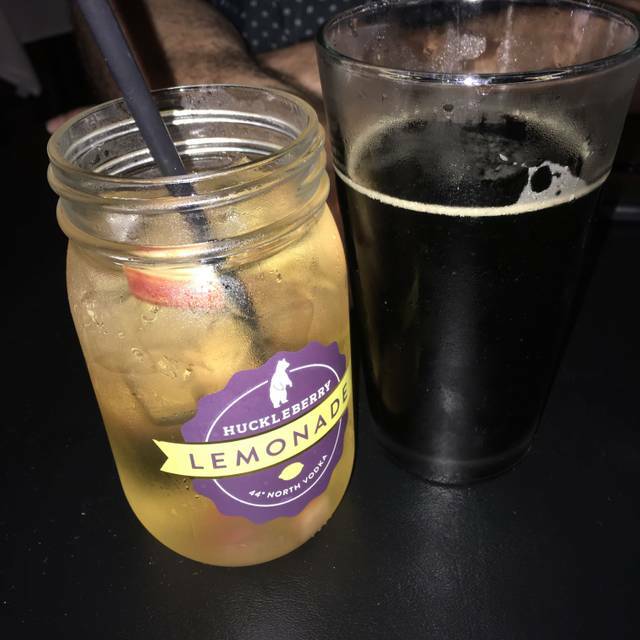 The host recommended we stay at the bar - yeah, not what we want for a romantic date night. The second recommendation was the worst table in the restaurant - by the door, the server computer, and open on all sides - a generally awkward and uncomfortable position. Luckily a corner table opened up. Our server said the beef stroganoff is the best dish on the menu, and I believe him! It was DELICIOUS. The meat was as tender as butter, the sauce was tasty and rich but not too heavy. Yum. I ate it all. My partner got a chicken pasta dish that was not on the menu. It was fine but nothing special. 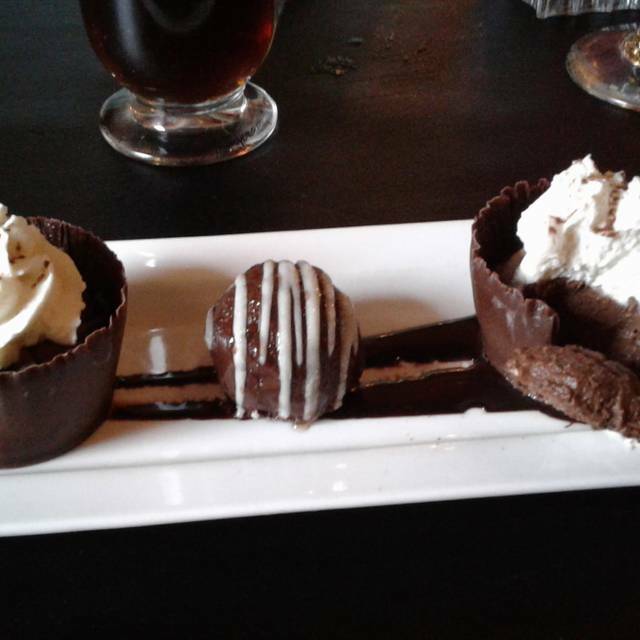 For dessert, we shared the chocolate dome. MMM. Rich, chocolatey goodness. 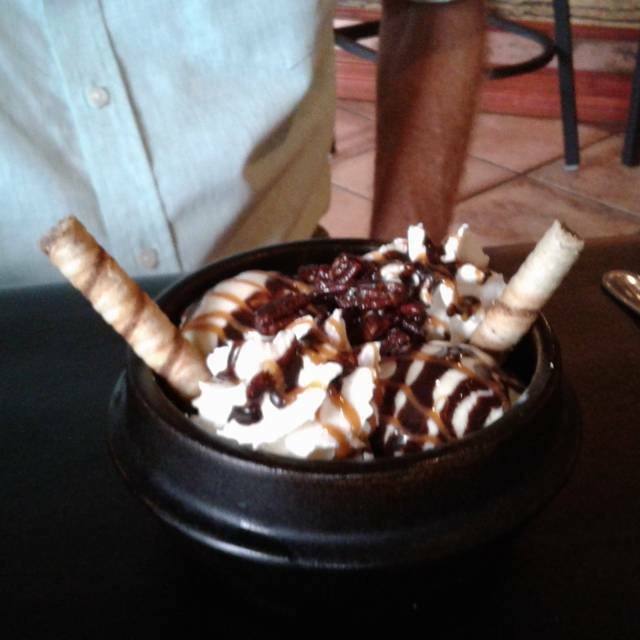 Would go back just for this dessert. The wine we had was also superb - one of the red Vinnums. Our server was great. Nice, knowledgable, helpful, and checked on us just enough. He was also bilingual in Spanish, which was a stroke of luck for us because my sweetie speaks Spanish (definitely got an extra tip for that). The atmosphere is cozy. The tables are close together but still comfortably navigable. There were piney branches festooning the ceiling and trellises scattered to make the dining room feel like a few small rooms. Overall, the feel is of a secret garden. Recommend for a date night. Although we made a reservation weeks in advance, we were seated in the very back of the restaurant at a table too small for 7 people. The waiter was very nice and efficient, but the food was pretty disappointing, which is a shame because it used to be quite good. The grilled Caesar salad was cold and the roasted vegetables in the "Warm and Toasty" salad were not cooked. It's a great space, but needs some work on the food. a perfect mood for fun and innovative, skillfully made dishes. Excellent food, great service and interesting menu. Will take family there when they are in town. Met a friend for lunch and really enjoyed the food. The soup (beef, barley and lamb), sandwich (salmon) and dessert (creme brulee) were all delicious. Will definitely return! Tired is the second time I've been at this restaurant and I really enjoyed it. Was great! Fast service even on a busy night! This was an excellent dining experience. We will return. 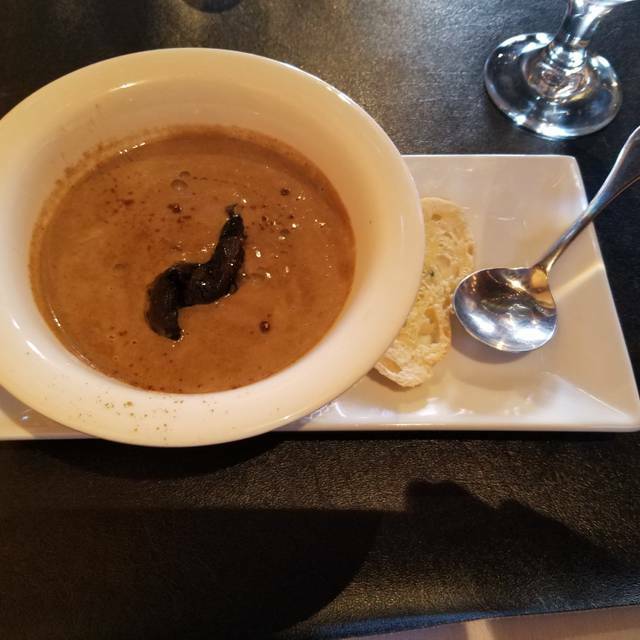 A friend from the Midwest joined us at B-K, and he was very pleased with the food and service. (My wife and I have always enjoyed the B-K). We will always keep coming back for more! Kevan, we really like your menu and the vibe. Our family dinner was good, but there were 2 hiccups. Specialty martinis should always be filled to the top of the glass. The pumpkin martinis (2) were filled half of the glass. Two missteps ...and we steered away. The noise level was intensified by the speaker above our table. It’s close quarters, a Saturday night and the stereo was too loud. 8:15 reservation but we weren’t seated until 8:40 and it took another 20 minutes for the host to let the server know we were her table. No drinks for another 15....not going to be a return patron. No thanks.